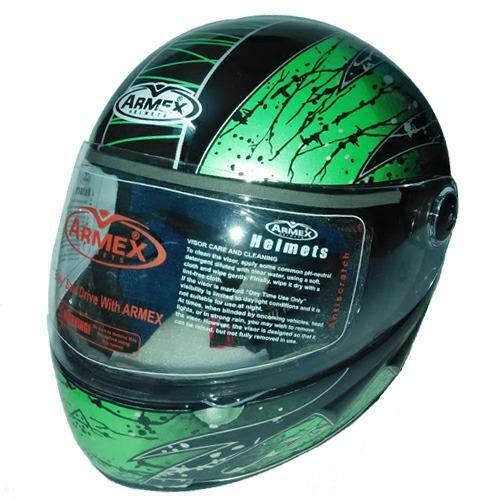 We are one of the leading manufacturers and traders of optimal quality Motor Bike Helmets. These Motor Bike Helmets are designed keeping in mind all the safety norms, thus, provides maximum safety to the user. The Motor Bike Helmets offered by us are widely acclaimed for easy adjustments, strength and durability. We have established a strong foothold in the market as one of the leading Helmet Manufacturer. We deals in Two Wheeler Helmets, Full Face Helmets, Open Face Helmets and Motorcycle Helmets. We only deal in best Quality Two Wheeler Helmets. We have No. of models in Two Wheeler Helmets like Full Face Helmets, Open Face Helmets ,Off Road Helmets etc. We have registered a phenomenal growth in this short span of time by consolidating on our state-of-art manufacturing unit, use of latest technology in production and the efforts of our diligent and proficient team of professionals.